Joe at one of his favorite spots near Yachats on the dramatic Oregon Coast. Deb at home near Kings Valley in the lush Coast Range of Western Oregon. Joe with his daughters Rhea, a photographer, and Chloe, the owner of Seattle's BrambleBasics Skin Care. Below is a picture of Deb with a woman everyone adored, the late Betty Fulton. Joe Fulton is an Oregon writer, genealogist, educator and running coach. He is the author of From Beardstown to Andersonville; Brewmaster's Bombardier & Belly Gunner; and How To Pass The US Citizenship Test. He has also written several articles and essays for newspapers, magazines and web sites. Joe is currently working on : Dam Right! Oscar Kendall, Fred Lynch & The Lynch Brother's Diamond Drilling Company. It will be published in 2014. Joe is married to Debra Hascall. They have three grown children; Chloe, Leland and Rhea. Joe & Deb live in the beautiful coast range of Oregon where they have operated a popular running camp for 25 years. Deb created Originario Productions in 2007. Joe & Deb's son, Leland, is an environmentalist and devoted distance runner. 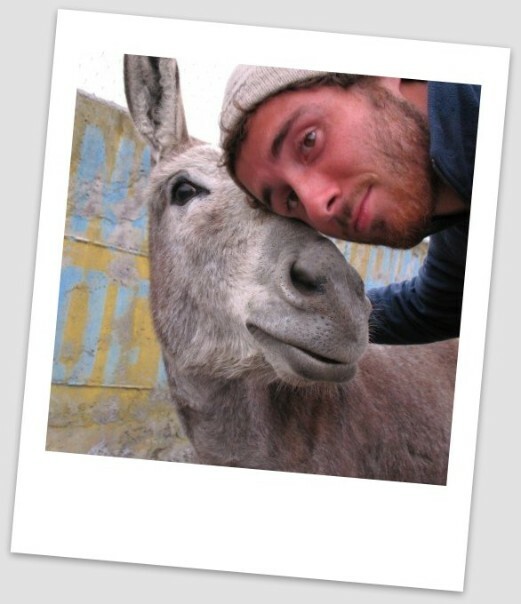 Here he is with a friend he met in Ecuador. He was told that the little burro did not like people! Apparently, that was before he met Leland.